Keeping up with the latest gaming products can be hard on the pocket but if you take advantage of these amazing discounts you can play for less. Find great deals on consoles, games and accessories for PS3, PS$, XBox 360 XBox One, Nintendo Wii, WiiU, 2DS, 3DS and XL and PC gaming. Save on sofas sets, lawnmowers, rattan furniture, lazy spas, BBQs and much more. Save on many products from huge brands like Apple, Acer, HP and Dell. Save on selected laptops including Macbooks and Chromebooks from huge brands like Apple, Google and Microsoft. Where do I use my Littlewoods voucher code? "Check out the Littlewoods Clearance eBay outlet for big savings of up to 80% on fashion & home with up to 50% savings on electricals." 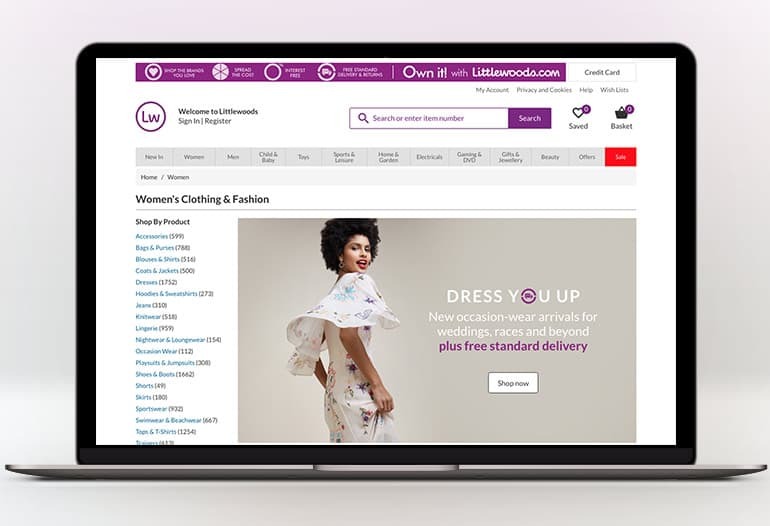 Once a beloved high-street chain, the modern Littlewoods is now a dedicated home shopping organisation that offers the same great value and quality customers came to love with the added convenience of ordering online. We also list 2019 existing customer codes for Littlewoods when we come across them so you can enjoy excellent savings on a wide selection of goods, from homeware through to sports equipment, from top brand electrical products and toys to the latest trends in fashion. The beauty of Home Shopping from Littlewoods is that you can purchase almost everything and anything without even leaving your front door! Littlewoods offers a range of delivery options so that you are able to have your order delivered at a time that is convenient for you or even pick up from a convenient Collect+ point. 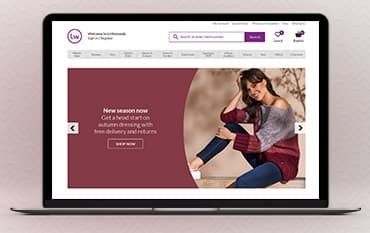 If you place your order on the Littlewoods website you can easily see whether the item you want is in stock, and in the case of clothing, if they have the size and colour of your choice. Shopping from home also means that you have more time to look at the products and make a decision on what to buy, easily comparing items. So let Littlewoods take the stress out of your shopping. Peruse the Littlewoods catalogue from the comfort of your own home by either ordering a hard copy to be delivered to your door or by simply browsing from the Littlewoods website! The catalogue is packed full of fashion for all the family, with a great range of women’s, men’s, girl’s and boy’s clothing boasting catwalk styles, as well as a huge range of Home & Garden items. You can also find toys, electricals and beauty items from all the top brands and often with some fantastic discounts available. Why not use our discounts codes too, and you could save extra cash on your next purchase! The Catalogue is divided into sections, grouping similar items together, making it easy to find what you are looking for, the website is also easy to navigate. So whatever you are in search for, Littlewoods will probably have it and at a great price too. Start your search today! Choose from a wide range of women’s, men’s and kid’s fashion in the Littlewoods clearance section where you could save yourself a fortune! From sportswear featuring some of the biggest brands including Adidas, Nike & Puma! Plus, enjoy big bargains for your home and garden. You’ll find all the latest deals rounded up right here with most items half price or more! Find all the brands you love at a price you can afford. Everything must go so if you see something you love, don’t hesitate to get it or you might just regret it! Why not add one of out discount codes onto your item at the checkout too, and you could save yourself some extra cash on top! Click and collect for free when you order by 7pm. Expected delivery: Delivered within 2 days. Some promotional lines may take up to 10 days. Between 7am - 9pm, Mon - Fri.
Expected delivery: Between 7am - 9pm, Mon - Sat. Littlewoods will replace or refund most goods for free, provided they are returned within 28 days of receipt complete, unused, in their original packaging and with any security tags intact. You can send Littlewoods a secure webmail and they’ll aim to get back to you within 24 hours, simply log in to 'My Account', go to 'My Details' then 'Account Queries'. You can call the Customer Services Team on Freephone 0800 092 3444. They are available 7am to 11pm, 7 days a week. Or Keep in touch with them on Facebook and Twitter. Littlewoods is your one stop shop for everything you need from fresh, off-the-catwalk fashion to beautiful home accessories and everything in between! By using one of our Littlewoods discount codes, you can pile saving upon saving. The flexible delivery options to both your home and to Collect+ delivery stores, including free 48-hour delivery and free returns, let you pick the arrangement that’s most convenient for you making your shopping experience even more simple. We are constantly on the hunt for first order Discount Codes for Littlewoods to help you with your money saving. Our experts check dozens of sites for secret codes including NHS discounts, student sites & social media channels saving you time & money!